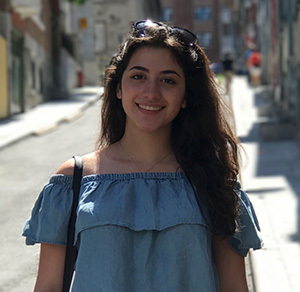 My name is Simona, and I am a second-year student at McMaster University, and president of the McMaster Crohn’s and Colitis Club. I was first diagnosed with ulcerative colitis in 2012 when I was 13 years old. Although ulcerative colitis has impacted my life in various ways, it has played a positive role in establishing who I am as an individual. My experience with ulcerative colitis has empowered me to raise awareness in my community, and to advocate for those suffering with these chronic illnesses. Advocacy and community involvement are crucial elements in raising awareness; which is why the Gutsy Walk is one of my favourite events. When I was first diagnosed I was quite overwhelmed, afraid, and unaware of how it would impact my life. However, over the years I have met amazing people, practitioners, patients, and advocates who constantly inspire me to be an active participant in raising awareness. My advice to those currently dealing with Crohn’s or colitis is as follows: I know it is said often; but you will have some bad days and some good ones, however you are stronger than you think. Remember, you do not have to battle it alone. Speak to others who understand your concerns, and get involved within the community! Support is crucial and a huge part of the treatment/healing process.